Forandring af organisationer er jo så godt som umuligt – ikke sandt? Noget af det sværeste indenfor ledelse er forandring, og forandring af organisationer er den måske sværeste disciplin overhovedet. Sådan er det typisk, når man taler om forandringer, og derfor lader mange være med overhovedet at forsøge. Change is hard in the same way that it’s hard to finish a marathon. Yes, it requires significant effort. But the fact that it requires effort doesn’t negate the fact that most people who commit to a change initiative will eventually succeed. This point has gone largely unnoticed by an entire generation of experts and laypeople alike. I am just as guilty of this omission as everyone else. But now that we know the truth, don’t we have a duty to act on it? Isn’t it time to change the way we talk about change? I artiklen kigger Tasler blandt andet på den klassiske opfattelse, at 70 procent af alle forandringer slår fejl. Men passer det? The insidious myth that change initiatives usually fail is disturbingly widespread. Most experts, for example, state that 70% of change efforts fail, but a 2011 study in the Journal of Change Management, led by the University of Brighton researcher Mark Hughes found that there is no empirical evidence to support this statistic. In fact there is no credible evidence at all to support the notion that even half of organizational change efforts fail. Tasler beskæftiger sig blandt andet med vores menneskers negative ‘bias’, altså at vi hurtigere tror, noget går dårligt, end at det går bedre. I artiklen er det forklaret med et eksempel: Da deltagere i et studie blev præsenteret for statistik på en sportsudøver, der havde haft en dårligere sæson end ellers, var de hurtige til at konkludere, at vedkommendes karriere var på vej nedad. Men når de samme mennesker blev præsenteret for statistik på på en gennemsnitlig udøver, der havde haft en god sæson, konkluderede de, at der var tale om et lykketræf. As leaders and consultants we need to be aware that our team members are not entering change situations with a blank slate. Two decades of hearing about mythical failure rates has planted the seeds of bias against success in our minds. And every time we say “change is hard” we water those seeds. I et afsnit fra 3. november 2016 af Harvard Business Reviews podcast, ‘IdeaCast’, er der et interview med Stephen Heidari-Robinson og Suzanne Heywood. 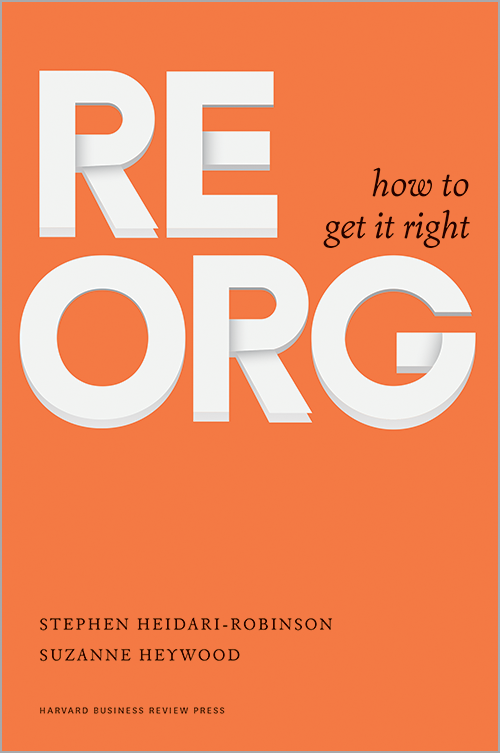 De er forfattere til bogen ‘ReOrg: How to Get It Right’, der handler om netop organisationsændringer. Forsiden af Heidari-Robinson og Heywoods bog. Undervejs i interviewet kommer forfatterne med en række gode anbefalinger i forbindelse med organisationsændringer – og især forberedelserne og kommunikationen om dem. I think the most important thing that people can do is by actually planning their reorganization properly and trying to accelerate the time that it takes to deliver as much as possible. Because if you assume that people are going to be upset and distracted while the reorg is going on, you can minimize that, but it will happen. Then the amount of time that you spend being in that state is obviously going to cause more problems and more time that you’re doing it. So if you accelerate the reorg, you actually minimize that period of disruption. And this is very counter-intuitive for people. I think many times in reorganizations, they think that, if we move slowly, if we sort of move in an evolutionary way, people will be less upset. And the reality is that they’re actually more distracted for longer, so the impact is worse. People try and do the right thing, but the outcome is not what they wanted. So that’s the most important thing, I think. Netop hastigheden ved organisationsændringer bliver fremhævet i en anden Harvard Business Review-artikel, How to Pull Your Company Out of a Tailspin af Chris Zook. Han er partner i Bain & Companys Boston-kontor og “a co-head of the firm’s global strategy practice for twenty years”. When a company is in free fall, it makes sense to replace the management team, for all sorts of reasons. First, you need to inject new energy into a tired organization under stress. Second, you need to ensure that the team you’re building is made up of people with open minds who want to invent the future, not just defend the past. It’s unreasonable to expect the architects of the strategies and practices that led to your downfall to see the error of their ways, or the right path forward. Instead, you need to find leaders and employees with a rebellious spirit. Third, you need to locate key employees at the front line and promote them — as a source of knowledge and energy, and as a signal that the future will be about merit and open-mindedness. Finally, you need to make change happen relatively quickly. If you replace your team gradually (which can be tempting because it seems less disruptive), you’ll lose valuable time, and the employees you bring in will begin to absorb the organizational biases of the past. Kort fortalt: Det er fristende at holde lidt igen med tempoet, fordi det jo for pokker må virke mindre forstyrrende for folk. Men det forlænger bare den tid, hvor folk går rundt med deres tvivl, og det bringer fordelene ved forandringen i fare. With regard to communication about what the reorg is about, I think it’s just transparency. People dislike negative impact from their jobs, so they dislike uncertainty even more. So I think, at the beginning of the reorg, you may not know exactly who might be at risk of their job. You might think that they may not be at risk, but you find out later. So I think it’s important at the beginning to not try and excite people but just to say, look, this is why we’re doing it. Give a reason that people understand, not just x percent of ROI, which no one will understand what you’re talking about. Give a reason that makes sense for them, either the company is in problems or this great opportunity out there. Talk about what the reorg is going to take and when people are going to hear. Så… er organisationsændringer bare “piece of cake” og noget, vi bekymrer os alt for meget om? De er i hvert fald ikke lette – men de kræver hårdt arbejde og koncentreret forberedelse (i virkeligheden er det nok her, mange fejler). Men de er ikke umulige, og ved at vi blive ved med at italesætte dem som hårde og kaste de ubegrundede 70 procent rundt, holder vi fast i en unødigt negativ fortælling. Og så skal vi være opmærksomme på, at noget ikke nødvendigvis bliver gjort bedre eller mere grundigt, selvom det får lov at tage længere tid. Hastighed kan have sine fordele, når man har med forandring at gøre – skønt det kan lyde ulogisk; det gjorde det i hvert fald for mig ?.